Nelson, B. R. (2013). Ex utero Electroporation into Mouse Embryonic Neocortex. Bio-protocol 3(24): e998. DOI: 10.21769/BioProtoc.998. Nelson, B. R., Hodge, R. D., Bedogni, F. and Hevner, R. F. (2013). Dynamic interactions between intermediate neurogenic progenitors and radial glia in embryonic mouse neocortex: potential role in Dll1-Notch signaling. J Neurosci 33(21): 9122-9139. This technique allows highly efficient and reproducible transfer of DNA/RNA into the embryonic neocortex of rodents across multiple ages. Ex utero electroporation compliments the more technically difficult in utero electroporation technique by maximizing the number of embryos for available for a given experiment, as well as increasing the variety of constructs used in each experiment, thereby helping to reduce their overall numbers. Ex utero electroporation followed by short term organotypic slice culture of embryonic brain sections allows immediate access to multiple slices for choosing optimal ones for live-cell imaging experiments, and characterization of various NSC manipulations in the intact stem cell niche. (see also “In utero Electroporation of Mouse Embryo Brains” (Ge, 2012); “Organotypic Slice Culture of Embryonic Brain Sections” (Calderon de Anda, 2013). Additionally, ex utero electroporated neocortices can be used for in vitro primary cell cultures with further dissection, dissociation into single cells, and plating on cover slips or in multi-well dishes according to standard techniques: note this procedure can be performed immediately after electroporation, prior to the onset of ectopic gene expression, or after overnight slice culturing to collect just the region of electroporated cells. Timed embryonic mice embryos: A wide range of developmental timepoints work very well for this procedure, from E10-18.5. Note however that earlier embryos (E10-12.5) are very delicate and may require modified vibratome slicing techniques and/or manual cutting with a micro-knife, which can be embedded in collagen 3D-gels (to help preserve tissue structure) and cultured on Millicell inserts, or floated as whole brain explants overnight in a multi-well plate on a nutator/rotator. Likewise, older embryos E17-18 will have more developed skin and craniums, requiring a bit more force to inject DNA solution into the ventricles, which are becoming smaller relative to the size of the animal. Collect timed embryonic mice embryos according to approved protocols at your institution. Hold embryos in ice-cold HBSS filled dish until ready for use. Pour melted agarose into a 35 mm dish ~1/2 to 2/3 full, and let solidify over ice. Cut a small trapezoid out of the center of the dish with a scapel, discard (Figure 1A). Fill this dish with HBSS to almost full (Figure 1A). Transfer single embryo into the well of this dish using cut transfer pipette or forceps (Figure 1A). Fill micropipette with DNA solution mixed with enough Fast Green to just visualize. Position embryo in well, and hold in place with forceps while micro-injecting ~0.2-0.5 μl DNA into the lateral ventricle. Flip embryo over, reposition, and microinject DNA into the contralateral ventricle. Note: Each ventricle should be visualized due to colored solution (Figure 1A). Hold tweezertrodes over the head in manner to target current into the dorsal neocortex. Note: The targeted position is highly dependent on the orientation of the tweezertrodes. For example, holding the positive electrode over the dorsal neocortex on one side of the brain means that the negative electrode will be placed in a more ventral/diagonal position, slightly under the contralateral jaw. This is most easily accomplished by using another pair of forceps in the other hand (i.e. left), while holding tweezertrodes in the other hand (i.e. right). Electroporate embryo using the remote footswitch: 3–5 pulses, 35 mV, 100 ms intervals. Flip embryo over, reposition tweezertrodes accordingly, and re-electroporate the contralateral neocortex using the same procedure. Varying electrode placement can target other specific regions, including the hippocampus/Dentate, ventral telencephalon, as well as other regions that contain a lumen. During electroporation, it is best to not contact the embryo directly. Transfer electroporated embryo into multi-well dish placed on ice with HBSS to recover using cut transfer pipette/forceps. Clean electrodes after each embryo electroporation by wiping with dry Kimwipe. Repeat procedure until all embryos have been electroporated. Note: Multiple different DNA constructs and combinations can be used within this ex utero procedure. Dissect the brain from each embryo, and transfer into ice-cold HBSS in new multi-well plate until all brains have been removed. Note: In some cases the meninges could be removed to help vibratome sectioning depending on the actual age of embryos, younger embryos are more delicate (E10-12). Embed brains in 4% low-melting agarose and prepare for vibratome sectioning and organotypic brain slice culture as described in (see Organotypic Slice Culture of Embryonic Brain Sections (Calderon de Anda, 2013). Slices can be visualized the following day with a fluorescent stereoscope. With practice, multiple slices should contain fluorescent cells in each neocortex. For example, Figure 1B shows typical example of RFP expressing plasmid targeted in to each neocortex in a wild-type embryo. 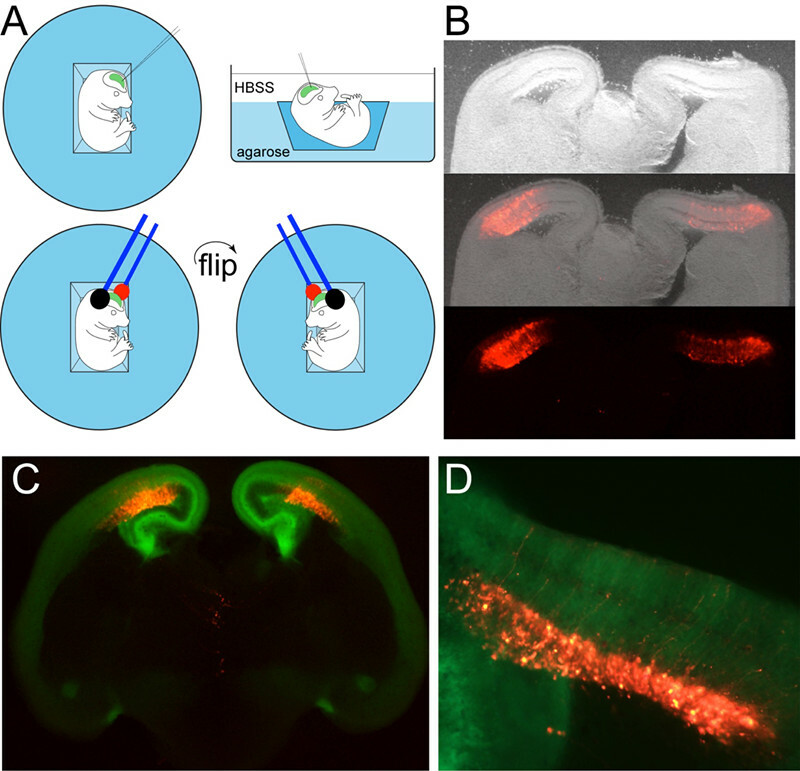 Figure 1C,D is example of RFP targeted into each neocortex of a transgenic GFP expressing animal (Nelson et al., 2013). Figure 1. Ex utero electroporation in embryonic mouse neocortex. A. Schematic of technique; B. Example of double electroporated RFP plasmid targeted to each neocortex in wild type E14.5 mice cultured overnight; C. Example of double electroporated RFP plasmid targeted to each neocortex in transgenic Tbr2GFP E14.5 neocortex; D. High power view. Black and red represent negative and positive electrodes, respectively, so keep in mind their orientation since it controls direction and targeting: green represents the Fast Green colored DNA solution that fills the lateral ventricles, revealing their shape, and indicates a successful fill. This protocol was adapted from Nelson et al. 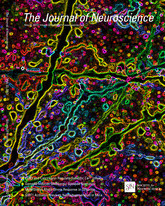 (2013), and was supported by NIH Grants R21 MH087070 and RO1 MH080766-S to R.F.H. Calderon de Anda, F. (2013). Organotypic slice culture of embryonic brain sections. Bio-protocol, 3(3): e327. Ge, X. (2012). In utero electroporation of mouse embryo brains. Bio-protocol 2(13): e231.